Orkney for many is the perfect embodiment of distance, isolation, myth and memory. The Orkney Isles are full of natural wild beauty, fascinating historic sites, brisk cold walks and warm, friendly and appealing welcomes. Orkney is known for its wildlife on land and sea and for its farm-life. It is the perfect place to get up close and personal with nature at its wildest. Orkney is also a heaven for food lovers and those who appreciate the finer things in life. Here you will not only find the wilder delights of the coast and countryside – in the largest settlements of the islands you will find many artisans, artists and craftspeople who, inspired by the scenery and spirit of these islands, have decided to make Orkney their home. Stroll the beautiful historic streets and sample some of the find products that are made on these industrious islands. There are a number of ways to reach these northern isles. You can take a leisurely trip by road and by ferry, or take the quick option and fly to one of the airports on the islands. Should you prefer to take the slower option, you can drive to one of the ferry ports, in Aberdeen, Scrabster, or Gills Bay. In summer, there is also a passenger ferry from John O' Groats. North Link Ferries operate sailings between Aberdeen and Kirkwall (and also to Lerwick in Shetland). They also run the 90 minute service that runs between Scrabster and Stromness. The fastest way to reach Orkney by sea, however, is the Pentland Ferries catamaran than sails between Gill's Bay and St Margaret's Hope on South Ronaldsay. You can fly to Orkney with Loganair from Glasgow, Edinburgh, Inverness or Aberdeen, or south from Shetland. Kirkwall is the capital of the Orkney Isles and their largest settlement. This is the main island's hub, with plenty of places to eat and drink, and get acquainted with some of the friendly locals. There is a handful of interesting historic sites here too, including St Magnus' Cathedral, the Bishop's and Earl's Palaces, stately ruins, and the Orkney Museum, with local history exhibits in an historic home. The second largest settlement on the main island of Orkney is Stromness, a pleasant town shaped by the sea. It can also be worthwhile spending a little time here, strolling the historic streets and visiting the local history museum, the Piers Art Centre, in a building once owned by the Hudson's Bay Company, and a range of art and craft galleries. The Orkney Isles offer history lovers a glimpse of one of the richest surviving neolithic landscapes in Europe. Orkney has been inhabited for a very long time. Evidence of early inhabitants can be found at the various sites which make up the Heart of Neolithic Orkney World Heritage Site. Sites included in this listing are Maeshowe Chambered Cairn, the Stones of Stenness, the Ring of Brodgar, the ancient village of Skara Brae and Barnhouse Stone. These fascinating sites are all within relatively easy reach of one another and can be explored for a better understanding of Orkney's early people. The causeways between mainland Orkney and South Ronaldsay, and nearby attractions of Scapa Flow tell the wartime history of the islands and British defence. Visitors can also see a chapel, made from an old Nissan hut and scavenged materials by Italian prisoners of war. To the east of Scapa Flow and half way between the main island and South Ronaldsay lies the small island of Burray. As you cross the causeways that link the islands, and learn more about the wartime history, consider paying a visit to the Orkney Fossil and Heritage Centre and taking a little time to explore away from the main road, perhaps doing a spot of seal watching or enjoying one of the islands quiet sandy beaches. Moving on to South Ronaldsay across the causeways, you will find this island ideal for discovering local art, craft and produce. Visit the workshop and craft gallery in St Margaret's Hope, and Hoxa Tapestry Gallery before heading down to the south of the island to visit its main attraction, the Tomb of the Eagles, another of Orkney's fascinating pre-historic sites. A walk of around 1km will lead you from the visitor centre to the Stone Age tomb, calling at a Bronze Age site along the way. At the heart of Orkney's outer isles, Eday is a relaxed and natural setting, where the local people are far outnumbered by the wildlife. The small island of upland moors, grasslands, freshwater lochs and stunning coastline is just 8 miles along. In addition to its natural attractions, Eday is set apart by its connection to Orkney's renewable energy industry. Here, surplus power from the European Marine Energy Centre's tidal test site and a community run wind turbine are converted into hydrogen gas before being transported to Kirkwall where it is used to run local ferries. You can get to Eday on the daily ferry service from Kirkwall, or choose to take an inter-island flight. Take a ferry south from Stromness to visit the island of Hoy, the hilliest of the Orkney Isles and surely one of its most beautiful and interesting. On Hoy, there are a number of things to see and do, including a number of hikes. One of the best will take you to view the Old Man of Hoy, a stately sea stack towering beside craggy cliffs on the west coast of the island. A short walk will also allow you to visit the 'Dwarfie Stane' – a megalithic chambered tomb carved from a huge solid boulder of Devonian old red sandstone, located in a stunning glacial valley. The fascinating Scapa Flow Museum is also a must-see on this island. The northernmost of the Orkney Isles, North Ronaldsay is known for its seaweed eating sheep and distinct culture. This island is one of the best birdwatching sites in the Orkney Isles – it is on the flight path of thousands of migrating birds. There are also a number of other attractions here, including the Broch of Burrian, and the tallest land-based lighthouse in Britain. There is a weekly car ferry here from Kirkwall each Friday, and daily flights. If you have a penchant for history then most of the islands of Orkney will have something to catch your interest. On Rousay, for example, there are more than 160 archaeological sites, the most impressive of which can be found along the Westness Heritage Walk. On Egilsay, just to the east of Rousay, you will find Egilsay and Wyre. Egilsay was an important pilgrimage site. Here you can see the 12th Century church of St Magnus with its Viking round tower. Wyre also has an intriguing history, with the ruins of a castle built by Viking giant Cubbie Roo. Known locally as Papay, Papa Westray is best known as the site of the oldest house in Europe, the Knap of Howar. This Neolithic farmstead predates the Egyptian pyramids by over 1,200 years! You can catch a ferry here from neighbouring Westray but for the novelty, you may wish to take a flight instead. This is officially the shortest air route in the world – you'll be there in around two minutes! Sanday's name gives it away, this island is famed for its sandy strands. Stronsay is also known for its beaches, and is known as the Island of Bays. Yet these are not the only islands of Orkney whose gorgeous beaches are a main attraction. Across these islands you will have no difficulty in finding a breathtaking sandy beach, and more often than not, you can have these stunning strands all to yourself. There is so much to see and do on the Orkney Isles, there is no way that you will discover it all on just one trip. But once you've had a taste of these beautiful islands, no doubt you will be eager to plan a return visit to see what else they have to offer. Shetland has a lot to offer, from history and culture to stunning scenery and wonderful wildlife. This remote location is closer to Norway than to London – a place to really and truly get away from it all. On the Shetland Isles, you stand a better chance than anywhere else in the UK to see the stunning Northern Lights. While nothing is guaranteed when it comes to seeing the Aurora Borealis, you stand a reasonable chance, especially over the winter months. Most of the archipelago, excluding the capital, Lerwick, has very little light pollution and wild camping is allowed so it is easy to get away from everything and have the night skies to yourself. Another reason to visit in winter is to experience Up Helly Aa. For 24 hours on the last Tuesday in January, Lerwick leads the way for community celebrations of their Viking heritage each and every year. After Lerwick's festival is over and done, it is the turn of other communities to hold their own versions of Up Helly Aa, welcoming visitors in their own special ways. This cultural spectacle is certainly something worth making the long trip north to experience. At any time of year, there is more to see and do on this windswept and remote islands than you may have imagined, and whatever you choose to see or do during your time here, you are sure to receive a warm welcome. Shetland is now easier to reach by ferry than ever before. You can take the North Link 12-13 hour overnight Ferry from Aberdeen seven days a week throughout the year, arriving in Lerwick at 7.30am, or make the shorter crossing of around 7 hours 45 minutes from Kirkwall on Orkney. You can also take the quicker option and fly to Shetland. Loganair flights run to Sumburgh airport on the main island of Shetland from Aberdeen, Edinburgh, Glasgow, Inverness (via Orkney) and from Bergen, Norway, during the summer. You can also now take a flight from Manchester once a week on Saturdays. 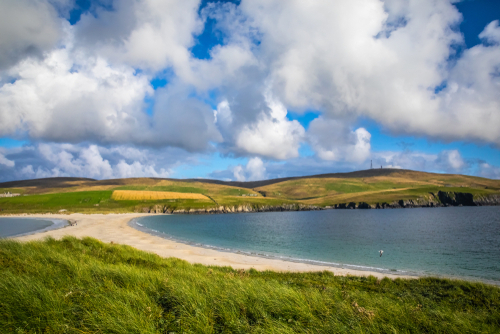 If you have already visited Orkney, the flight to Shetland from Kirkwall takes just 40 minutes. Lerwick, the capital of Shetland, is a charming and friendly place, with far more amenities than you might imagine. Here, you will be able to get food, and anything else you may need for the rest of your adventure. Check out the 18th Century sandstone buildings on the waterfront, and the Victorian 'new town'. There is also a local museum to explore. For 24 hours on the last Tuesday in January, Lerwick leads the way for community celebrations of their Viking heritage each and every year. After Lerwick's festival is over and done, it is the turn of other communities to hold their own versions of Up Helly Aa. This cultural spectacle is certainly something worth making the long trip north to experience! One of the best-preserved prehistoric buildings in Europe, this Iron Age broch is located on the small island of Mousa. Now uninhabited, the island on which it stands is now also an important RSPB Nature Reserve. You can tke the small ferry boat to Mousa from Sandwick at the south of the main island. Those interested in learning more about life on the Shetland Isles should be sure to visit the Croft House Museum, in Boddam. This former croft house was built in the mid 19th Century and was lived in until the 1960s. Here you can travel back in time to see what life was like for the crofters who lived here. The man of the house was a fisherman, seaman or whaler, and his wife and family would have worked the land here in his absence. This archaeological site boasts Iron Age, Pictish, Viking, and Mediaeval remains. This place has been a settlement for thousands of years, each new generation building on top of what came before. An Iron Age broch 4m of surviving wall can be seen here, along with other remains. Another of the most important archaeological sites here on the Shetland Isles is that at Jarlshof. The remains of a multi-period settlement were found here when exposed by a violent storm in the late 19th Century. The name of the site was created by Sir Walter Scott, during his writing of 'The Pirate'. It refers to a fictional house based on the Old House of Sumburgh, which towers over the historic remains. These lochs are two of the best birdwatching sites on the main island of Shetland. This area is designated as a special protection area for wildlife conservation and the Loch of Spiggie is an RSPB Nature Reserve. St Ninian's Isle is connected to the main island by means of the largest tombolo (gravel/sand bank) in the UK. Along the side of this tombolo is one of the finest sandy beaches on the islands – rightfully famed for its scenic appearance and pristine pale sands. On the island you will find the ruins of St Ninian's Chapel. Treasure dating to around 800AD was found beneath the church floor in 1958. This tower house castle was built in the early 1600s, completed in 1607. It was constructed for Patrick Stewart, 2nd Earl of Orkney, during a period when he effectively ruled Scotland. 'Black Patie' as he became known, was notorious for his oppression of the people of these isles. He was accused of using forced labour in the building's construction and was ultimately executed in Edinburgh in 1615. One of the most pleasant walks on the west of the main island of Shetland will take you to the remains of the Broch of Culswick. In addition to seeing the ruins, this site also offers wonderful views of Foula and Vaili Isles, and Fitful Head and Fair Isle far to the south. Those who really want to get to know Shetland should leave the main island behind and venture onto some of the other main islands of the archipelago. Papa Stour is famous for its dramatic coastline, with its rugged cliffs, sea stacks, tranquil bays and the longest sea caves system in the British Isles. This isle is ideal for those looking for a tranquil holiday. There are also a number of notable archaeological sites on the island, which played an important role in Shetland's early history. Yell is the second largest island of the Shetland archipelago. It is a fantastic place to see wildlife, including skuas, red-throated divers and otters. There are several important nature reserves on and around the island. This is also a great place for a hiking or walking holiday, with a range of delightful coastal walks. On Yell, you should be sure to visit Old Haa Museum, in Burravoe – an interesting local museum housed in a merchant's house dating from 1672. The adventurous should be sure to make time to travel to Unst, the northernmost inhabited island of the British Isles. Unspoiled views, wonderful wildlife and outdoors adventure characterise this remote and enticing spot. Two small visitor centres teach visitors more about the island's history and heritage, and historic sites include Muness Castle and the Viking Unst project. Here you may spot whales, dolphins, seals, otters, and a wide range of bird species. Nature reserves and beautiful beaches on the island are great spots to watch the local wildlife. Set apart from the other Shetland Isles, around half way between them and the Orkney Isles, lies Fair Isle. This small, jewel-like island is known for its knitwear, its bird life, and historic shipwrecks. It is owned by the National Trust for Scotland. Visit the Fair Isle Bird Observatory to learn more about the local wildlife and explore the many scenic spots and archaeological sites across the island. There is, of course, far more to learn and discover on the Shetland Isles. The above is just a fraction of what lies in store. So why not plan your own Shetland adventure and come here to see these mystical, fascinating islands for yourself?